Sutton merges the best of family biography with relevant and fascinating historical, social, and religious knowledge. Claudette E. Sutton’s Farewell, Aleppo is much more than a recounting of her family’s story. Incorporating elements of history, religious struggles, pursuit of dreams, and the strength of kinship to create a stirring tribute to the foresight of her grandfather and the strength and perseverance of his offspring, Sutton craftily weaves interesting story lines into an encouraging and intriguing narrative. Sutton’s Jewish grandfather, Salim, lived in Aleppo, Syria, and was an importer of textiles from Europe and other areas. But he was able to notice the signs of increasing animosity towards Jews as World War II began to unfold. Although Syria was far from the center of action, Salim decided that he must find a way to get his family out of Syria and eventually to America. Knowing it would be a long process, he first sent his son Mike (Claudette’s father) to Shanghai to live and work with Salim’s brother, Joe. Other members of Salim’s family would follow similar paths, but Salim decided to never leave Syria. Sutton vividly describes Jewish history and lifestyle in Syria, and provides information into political and cultural stress points between Middle Eastern Jews, Muslims, and other groups, lending insights into current situations in the region. She also points out differences and changes between Jewish groups and their religious observances and beliefs, and how they have changed over the generations. Sutton gives ample attention to each story line and easily manages to relate them to each other. Sutton adds depth and clarity to her accounts by providing interesting, helpful information on world events—such as the fall of the Ottoman Empire and World War II—that impacted the family’s time in Syria and the choices the family made. Without this backdrop, the urgency and importance of Salim’s decisions would have been less compelling and dramatic. Sutton appropriately avoids attempting to editorialize or manipulate the historical accounts—like Germany’s treatment of Jews—and simply intertwines them with her family’s story for an effective, powerful narration. Sutton’s smooth writing style conveys the pride she has for her family and her religion while revealing enough insights into her family to make the story highly readable without being so personal that outsiders would not be interested. 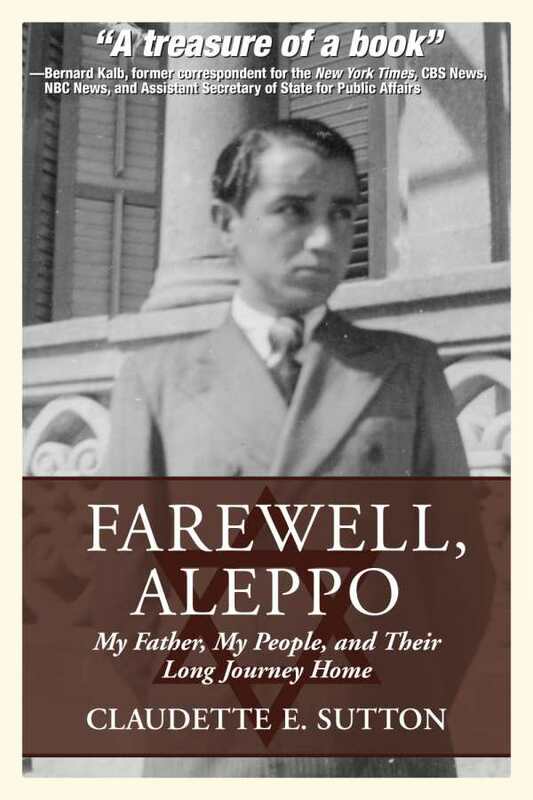 Farewell, Aleppo is an enjoyable and enlightening story.